Adipose tissue secretes a variety of bioactive substances that are associated with chronic inflammation, insulin resistance, and an increased risk of type 2 diabetes mellitus. While resistin was first known as an adipocyte-secreted hormone (adipokine) linked to obesity and insulin resistance in rode..
Metabolically healthy obesity: a friend or foe? Obesity is associated with a reduced life expectancy, largely because obese individuals are at an increased risk of type 2 diabetes, cardiovascular disease, and several types of cancer. Much interest has recently focused on the concept of “all obesity is not created equally.” Obese individuals wi.. In the past, liver cirrhosis was considered an irreversible phenomenon. However, many experimental data have provided evidence of the reversibility of liver fibrosis. Moreover, multiple clinical studies have also shown regression of fibrosis and reversal of cirrhosis on repeated biopsy samples. As v..
Studies investigating diabetic nephropathy (DN) have mostly focused on interpreting the pathologic molecular mechanisms of DN, which may provide valuable tools for early diagnosis and prevention of disease onset and progression. Currently, there are few therapeutic drugs for DN, which mainly consist..
Gestational diabetes mellitus (GDM), defined as any degree of glucose intolerance with onset or first recognition during pregnancy, is characterized by underlying maternal defects in the β-cell response to insulin during pregnancy. 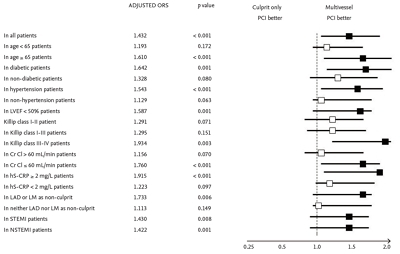 Women with a previous history of GDM have a greater than 7-fold hi.. The interactions between the cancerous cells of acute myeloid leukemia (AML) and the bone marrow (BM) microenvironment have been postulated to be important for resistance to chemotherapy and disease relapse in AML. The chemokine receptor CXC chemokine receptor 4 (CXCR4) and its ligand, CXC motif li.. Systemic lupus erythematosus (SLE) is a chronic autoimmune disease with diverse manifestations, and its pathogenesis is unclear and complicated. Infection and SLE are similar in that they both cause inf lammatory reactions in the immune system; however, one functions to protect the body, whereas the..
Background/Aims: To evaluate the clinical course of hip arthritis and the risk factors for hip joint replacement in patients with ankylosing spondylitis (AS). 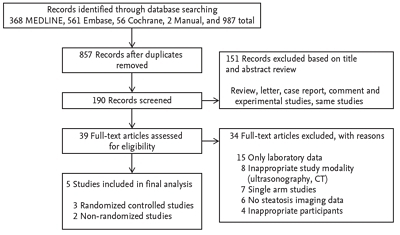 Methods: In this retrospective analysis, we evaluated 488 AS patients at a single tertiary hospital. At baseline and the most recent visit to..
Background/Aims: Sleep duration affects health in various ways. 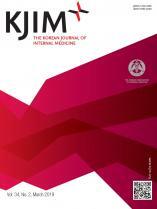 The objective of this study was to investigate the associations of sleep duration with chronic kidney disease (CKD) in a Korean adult population. Methods: This cross-sectional analysis was conducted for total of 1,360 participants who ..
Background/Aims: Diesel exhaust particles (DEPs) lead to elevation of reactive oxygen species, which can activate the nucleotide-binding oligomerization domain-like receptor (NLR) family members containing the pyrin domain 3 (NLRP3)-inf lammasome. In this study, we elucidated whether NLRP3 -inf lamm..
Middle East Respiratory Syndrome coronavirus (MERS-CoV) was first isolated from a patient with severe pneumonia in 2012. The 2015 Korea outbreak of MERSCoV involved 186 cases, including 38 fatalities. A total of 83% of transmission events were due to five superspreaders, and 44% of the 186 MERS case..
Background/Aims: Chronic urticaria (CU) is a common skin disorder characterized by wheals and pruritus lasting more than 6 weeks. Due to its long duration and changeable symptoms, the quality of life (QOL) of patients with CU can be impaired substantially. We evaluated the CU-QOL, a previously valid.. Application of photodynamic therapy in gastrointestinal disorders: an outdated or re-emerging technique? Photodynamic therapy (PDT) is a promising therapeutic modality that involves the administration of a photosensitizer followed by local illumination with a specific wavelength of light in the presence of oxygen. PDT is minimally invasive, has high selectivity for cancer, and has good patient complian..
Background/Aims: Eosinophilia has numerous diverse causes, and in many patients, it is not possible to establish the cause of eosinophilia. Recently, toxocariasis was introduced as one cause of eosinophilia. The aims of this study were to evaluate the prevalence of toxocariasis and the clinical impa..
Background/Aims: There may be an association between vitamin D levels and allograft outcomes in kidney transplant recipients (KTRs). However, few studies have been conducted to determine the association between vitamin D levels and post-transplant infections. This study investigated the impact of vi..
Is islet transplantation a realistic approach to curing diabetes? Since the report of type 1 diabetes reversal in seven consecutive patients by the Edmonton protocol in 2000, pancreatic islet transplantation has been reappraised based on accumulated clinical evidence. Although initially expected to therapeutically target long-term insulin independence, islet trans..